Multiple Israeli news outlets, including the Jerusalem Post, Arutz Sheva, Al Monitor, and the Times of Israel, this week reported newly declassified details of a planned surprise Hamas mega attack during the first week of the Gaza War last summer through underground tunnels built under Israeli territory. If the plot, first reported on Army Radio, had been successful, large numbers of Israeli civilians would have been slaughtered and captured. According to the reports, Hamas planned to take the kidnapped Israeli civilians to secret underground hiding places, and then use them as bargaining chips to free Hamas terrorists imprisoned by Israel. The plan follows a similar blueprint to the way Hamas pressured Israel to release 1,000 terrorists in exchange for kidnapped Israeli soldier Gilad Shalit in 2006. The well rehearsed Hamas plot involved sending scores of well trained Hamas terrorists dressed in IDF [Israel Defense Forces] uniforms through a labyrinth of secret Hamas tunnels burrowed under Israeli territory and exiting near the kibbutz community of Kerem Shalom. Had the unprecedented operation succeeded, Israeli analysts say it not only could have changed the course of the war, it also could have altered the existing dynamics between superior Israeli forces against the once-thought inferior Hamas terrorists for many years to come. A successful attack of this magnitude would have represented the most catastrophic and far-reaching terrorist plot ever undertaken by Hamas in its 26-year history. 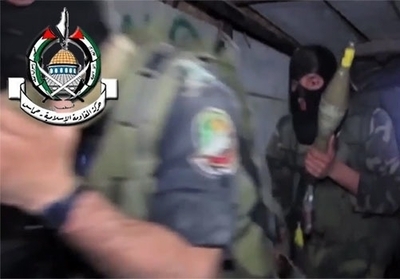 Hamas prepared for various aspects of the mission: One unit of the attack group was to battle incoming Israeli soldiers giving time to other units to murder Israelis – and most importantly – capture a large number of civilians to take them back to Gaza. A senior Israeli military official told the Investigative Project on Terrorism that there was even a more paramount goal: Hamas hoped the attack would lure large numbers of Israeli troops into the densely packed streets of Gaza. Those streets would have been rigged with thousands of mines and improvised explosive devises by Hamas. Hamas also built concealed strategic hideouts, established rocket launching pads and military bases at hospitals and schools—including those belonging to the United Nations —and dug more tunnels inside Gaza from which they would be able to launch attacks against Israeli forces almost at whim. According to the Times of Israel, the attack "was intended to force Israeli leaders to respond with a massive ground assault in the Strip, where Hamas had spent months rigging explosives and digging tunnels that would allow its fighters to exact a steep cost from any IDF incursion force." Deif's operation was all set to go, but at the last moment, Hamas leader Khaled Meshaal suddenly called it off. The reason? Meshaal feared a massive and devastating Israeli military response. According to Israeli intelligence sources, the terrorist organization's military wing vehemently disagreed with Meshaal's decision. The ensuing tension between Hamas' military wing and its political leadership affected the terrorist organization's decision-making throughout the war. Deif blamed Msshaal and the political wing for denying the group an historic success. Meshaal, in turn, consistently urged Hamas fighters to continue the war despite calls from within the military wing to accept a cease-fire a few weeks before the war's official end. By this point, Israel destroyed a significant portion of the terrorist group's capabilities and terrorist infrastructure, including many of its underground offensive tunnels. Still, Deif tried to launch similar mega tunnel operations. On July 17, 13 heavily armed Hamas terrorists suddenly emerged on Israeli soil from a tunnel that opened up near the southern town of Sufa. Their plan, according to Israeli military sources, was to massacre as many Israeli civilians as possible in the towns just a quarter of mile away. Fortunately, Israeli military helicopters spotted the terrorists as they emerged from the tunnels and wiped them out. This scene, according to Arutz Sheva, "sent shock waves through the Israeli public, which had never seen such a chilling sight or imagined it possible. The video of the incident was a major factor in prodding the government to decide on a ground offensive into Gaza, and guaranteed support from the public and media." Nearly a year after the war, Hamas is diverting cement and construction material intended for civilian rebuilding efforts in order to reconstruct its offensive terrorist capabilities, despite U.S. pledges that this wouldn't happen. According to Al-Monitor Hamas' "tunnel-digging enterprisecontinues at full throttle, with more than 1,000 people enlisted for the job. The shortage of cement does not hamper their work, because Hamas has found replacement materials." Instead of rebuilding homes for its people, Hamas uses heavy machinery and small bulldozers to restore its vast tunnel network that can be used in future attacks against Israel. Hamas is even acquiring new and longer-range rockets from Iran, the new U.S. partner in the "nuclear framework."